We defined money as anything that is generally accepted as a means of payment, is a store of value, can be used as a unit of account or a standard of deferred payment. What exactly is included? Cash in your pocket certainly serves as money. But what about checks or credit cards? Are they money, too? Rather than trying to state a single way of measuring money, economists offer broader definitions of money based on the concept of liquidity. Liquidity refers to how quickly an asset can be used to buy a good or service. Liquidity is a relative concept. For example, cash is very liquid. Your $10 bill can be easily used to buy a hamburger at lunchtime. However, $10 that you have in your savings account is not so easy to use. You must go to the bank or ATM machine and withdraw that cash to buy your lunch. Thus, $10 in your savings account is less liquid. Stocks and bonds are even less liquid, since they must be sold to convert them to means of payment, and they might suffer a loss in value in the process. Economists generally use two definitions of the supply of money: M1 and M2. M1 includes those assets that are the most liquid such as cash, checkable (demand) deposits, and traveler’s checks. M2 includes M1 plus some less liquid (but still fairly liquid) assets, including savings and time deposits, certificates of deposit, and money market funds. Let’s examine these two money definitions in more detail. M1 is the most narrow definition of the money supply. It includes coins and currency in circulation—in other words they are not held held by the U.S. Treasury, or the Federal Reserve Bank, but circulate in the economy. Closely related to currency are checkable deposits, also known as demand deposits. These are the amounts held in checking accounts. They are called demand deposits or checkable deposits because the banking institution must give the deposit holder his money “on demand” when a check is written or a debit card is used. These items together—currency, and checking accounts in banks—make up most of M1. Traveler’s checks are also included in M1, but have decreased in use over the recent past. A broader definition of money, M2 includes everything in M1 but also adds other types of deposits. For example, M2 includes savings deposits in banks, which are bank accounts on which you cannot write a check directly, but from which you can easily withdraw the money at an automatic teller machine or bank. Many banks and other financial institutions also offer a chance to invest in money market funds, where the deposits of many individual investors are pooled together and invested in a safe way, such as short-term government bonds. Another ingredient of M2 is small denomination (that is, less than about $100,000) certificates of deposit (CDs) or time deposits, which are accounts that the depositor has committed to leaving in the bank for a certain period of time, ranging from a few months to a few years, in exchange for a higher interest rate. In short, all these types of M2 are money that you can withdraw and spend, but which require a greater effort to do so than the items in M1. Figure 1 should help in visualizing the relationship between M1 and M2. Note that M1 is included in the M2 calculation. Figure 1. The Relationship between M1 and M2 Money. M1 and M2 money are the two mostly commonly used definitions of money. 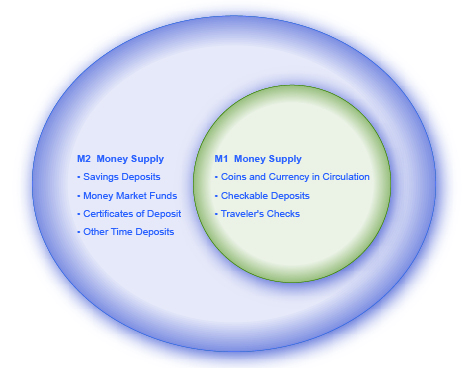 M1 = coins and currency in circulation + checkable (demand) deposit + traveler’s checks. M2 = M1 + savings deposits + money market funds + certificates of deposit + other time deposits. The Federal Reserve System is responsible for tracking the amounts of M1 and M2 and prepares a weekly release of information about the money supply. At the end of February 2015, M1 in the United States was $3 trillion, while M2 was $11.8 trillion. Table 1 gives a breakdown of the portion of each type of money that comprised M1 and M2 in February 2015, as provided by the Federal Reserve Bank. Where does “plastic money” like debit cards, credit cards, and smart money fit into this picture? A debit card, like a check, is an instruction to the user’s bank to transfer money directly and immediately from your bank account to the seller. Thus, a debit card is every bit as much money as a check. It is important to note that in our definition of money, it is checkable deposits that are money, not the paper check or the debit card. Although you can make a purchase with a credit card, it is not considered money but rather a short term loan from the credit card company to you. When you make a purchase with a credit card, the credit card company immediately transfers money from its checking account to the seller, and at the end of the month, the credit card company sends you a bill for what you have charged that month. Until you pay the credit card bill, you have effectively borrowed money from the credit card company. With a smart card, you can store a certain value of money on the card and then use the card to make purchases. Some “smart cards” used for specific purposes, like long-distance phone calls or making purchases at a campus bookstore and cafeteria, are not really all that smart, because they can only be used for certain purchases or in certain places. One key message underlying this discussion of M1 and M2 is that money in a modern economy is not just paper bills and coins; instead, money is closely linked to bank accounts. Indeed, the macroeconomic policies concerning money are largely conducted through the banking system.